Have You Changed the Tank Orifice? The abrasive tank in your Comco blaster has an orifice. It’s called (wait for it….) ‘the tank orifice’. 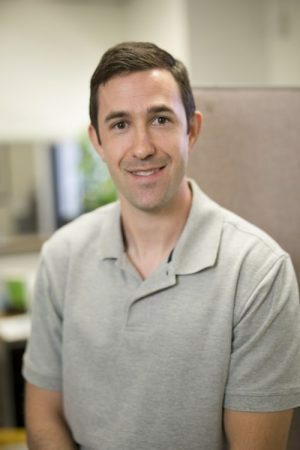 It directly impacts everything that is critical to your blasting process, like efficiency and consistency of results. Fortunately, you can use it to optimize your process. There’s a quick video below that shows you where the tank orifice is located on your Comco blaster and how to change it. But context is everything. So, before you skip ahead, let’s look at why this tiny component has such a big impact. All of Comco’s micro-abrasive blasters are built on our patented modulated feed system. This system creates a consistent abrasive stream. It uses an electromechanical valve to pulse air at a rate of 60 times per second. When the valve opens, a pulse of air pushes into the abrasive tank and fluidizes a small amount of abrasive. When the valve closes, a vacuum forms within the mixing chamber. This vacuum draws the air and fluidized abrasive down into the chamber, where it mixes together, before heading out toward the nozzle. 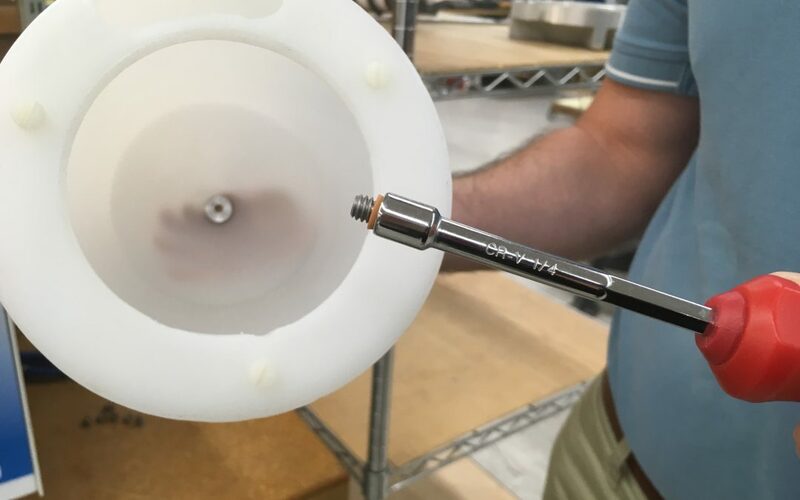 Air and abrasive must pass through the tank orifice to travel from the tank to the mixing chamber; therefore, the size of the tank orifice ultimately determines the amount of abrasive in the air stream. We use a fixed orifice that resists wear longer than other available options. Like our nozzles, it is made from a piece of precision ground carbide. We’ve found this material stands up to abrasive erosion better than others. Wear-resistance is important because the shape of a passage in a dynamic fluid environment has a significant impact on how material flows throughout the unit. If the edges of the passage become slightly rounded due to movement or erosion, more abrasive will pass through than needed. The tank orifice sits inside the machine away from the operator. If you have a heavy rotation of operators, this location provides an extra layer of control over your process. We put a ring on it! An O-ring, that is. This adds focus to the pulse of air as it enters the abrasive tank because it keeps air from seeping around the orifice. The Accuflo, in particular, requires this additional barrier because it pulses air with such force. It enhances consistency. Our modulated feed combined with this fixed tank orifice allows us to produce consistent flow machine to machine. 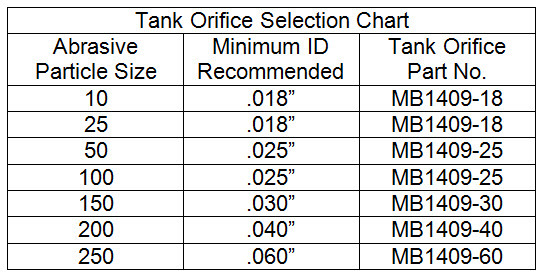 Nozzle size and abrasive selection determine your tank orifice selection. The diameter of the orifice should be smaller than the diameter of the nozzle. It seems obvious to state, but small orifices should not be used with large particle powders. Likewise, large orifices permit more powder in the line than a small nozzle can handle. The larger the orifice; the richer the abrasive stream. The tank orifice is available in a variety of sizes, ranging from 0.018″ to 0.060″. There is a quick selection chart below, or contact our Customer Service and Sales Teams. They can help you select the right size for your specific application. Just send them a message or give them a call at 800-796-6626. Over time, you may notice that your blaster is consuming more abrasive to process parts. That’s because the diameter of the orifice grows as it wears. As the size of the orifice increases, more abrasive pulls through on each pulse. You can check the diameter of your tank orifice with a pin gage. Replace the tank orifice after its diameter has grown by 10%. Quite simply, the tank orifice can be removed and installed with a ¼″ nut driver. The tank orifice is located at the bottom of the tank on the AccuFlo® and the MicroBlaster® and at the base of the basket assembly on the PowerFlo® and DirectFlo™.